Early voting will begin only at the Loop Super Site, located at 175 W. Washington St. 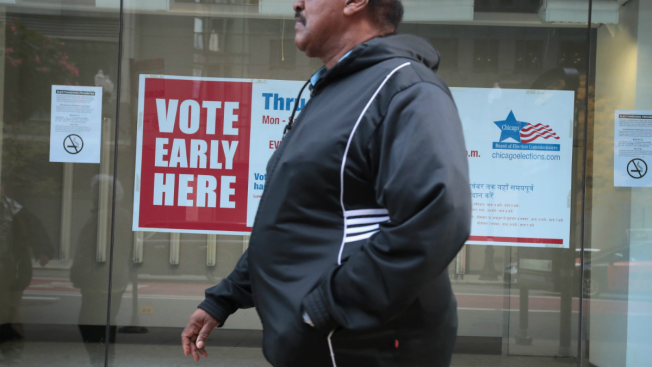 Early voting in Chicago's municipal elections will begin Tuesday, according to the city's Board of Elections. Early voting will begin Tuesday only at the Loop Super Site, located at 175 W. Washington St., according to the Board. The Loop Super Site will be open from 9 a.m. to 5 p.m. on Monday through Saturday, then from 10 a.m. to 4 p.m. on Sundays, election officials said. Early voting lasts through the Monday before Election Day, which is on Feb. 26. The start of early voting was delayed due to several challenges candidates filed against opponents' nominating petitions, in an effort to knock them off the ballot. The Electoral Board ruled on the last outstanding objections Friday, enabling the mayoral and aldermanic ballots to be finalized. Early voting at sites within each of Chicago’s 50 wards will begin on Feb. 11, 15 days prior to Election Day, the Board said. NBC 5 Political Reporters Carol Marin and Mary Ann Ahern have the recap of the week that was, including a presidential candidate that could shake up the race. For a full list of early voting sites in Chicago’s wards, voters can visit the Board of Elections website.